I kinda like these fellas just for their intriguenuity (yes, I did just make that word up). They are not just gum, they are gum with fun! First off, they have a slide out gum holder (the packaging is tube shaped, the gum sits in a “drawer” inside it) which I think is a step nicer than your standard plain box filled with stuff packaging. Plus, you can scootch the drawer in, or out and maybe in again or all the way off and then all the way on. Endless hours of entertainment! Next they wrap the gum strangely, or at least strangely from how I’ve ever seen anything else wrapped. Usually it’s either put the bit in the center and fold or twist into a wrapping, or put the piece on one edge and roll up into a wrapping. Xylish folds the wrapping first (about a 3/4 fold), sticks a piece of gum on the outer edge of the doubled up section and commences to roll into a wrapping. The gum wrapper is even only printed 3/4 with the Xylish logo while the part the gum is going to sit on is a dulled silver. The inside of the wrapping, the one under the 3/4 inside fold (maybe I should designate it the “inside inside”) is all shiny silver. It’s really quite an interesting packaging job. The fun does not stop there though, folks. 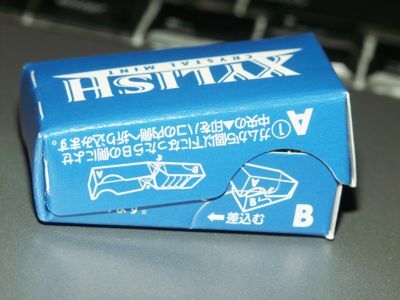 The gum drawer has nifty instructions on it that will allow you to fold it up into a smaller carrying case, a sort of half sized box of Xylish. I’m not entirely sure why since you have to have eaten half the gum in order to make everything fit in the new tinier box. The original box is not so ungodly unwieldy to warrant a smaller fold down box so I’m not sure what you gain. Plus, you have to wait until half your gum is chewed which seems weird to me. It just doesn’t work like the classic Trident big pack fold down as you go so I can’t really endorse the whole “smaller packaging” idea. It folds down into another completely different style box. It’s like an Autobot pack of gum! How cool is that? I think this just exemplifies the strange sort of inventions I hear of that come out of Japan: Really cool (like the washers you strap onto your legs for washing clothes as you are walking) but completely and utterly really rather useless (OK, you have two containers of water, soap and clothes strapped TO YOUR LEGS. Hello-ooo!). I’m going to give and entire pea point (yes, one whole pea) to packaging because the wrapper was a nice interesting touch and the minibox is really rather cool if not entirely practical. Plus, slidey gum drawer. Yeah, that gets a full pea. However, you didn’t come here for four paragraphs of packaging details, you came here to see if you could eat the stuff and not have to scrub your whole mouth out with pumice soap. The short answer is: Yes. Xylish is a very pepperminty gum from the first whiff out of the package to an hour and a half after your first crunch into it. I give it high pea points for flavor endurance because my mouth was still minty fresh after chewing it for 90 minutes. So far, cinnamon is the only flavor gum I’ve found that can do that. Now, it’s cinnamon and Xylish crystal mint. Nice show Xylish. The peppermint flavor is big on the peppermint but there is also something else in there that I wasn’t too fond of. I can’t place it, other than it hints of manufactured. I’m guessing the taste comes from whatever they are using as their sugar substitute (for did you notice that Xylish is sugar free? ), which might work for some people and not for others. It just gets down to personal sugar substitute choice; are you a NutraSweet type person or is Saccharin your gig? 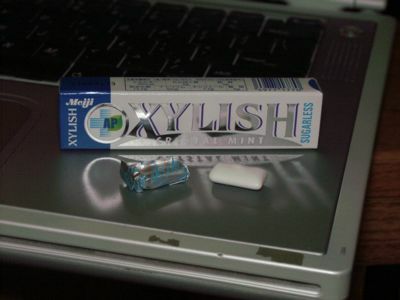 Xylish is really not bad for a sugarless gum but personally I’m not going to give up my Trident sugarless for Xylish. Since I have no Trident on hand though, I’m snacking on the Xylish. I will say one thing Xylish has over trident is that Xylish has a “candy” coating that goes crunch. I am the world’s biggest candy coated gum sucker so I appreciated the beegeebus out of the crunch. Xylish crunches for a while too, more so that the handful of Ford gum you used to be able to buy in gumball machines, not so much as Chicklets. 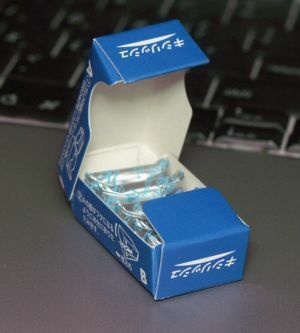 It is certainly better than Dentine or any other of the gums that have come out with the tablet type style of gum bits. Better by far. Xylish is also a pretty good chew. It’s not a smooth and soft gum, rather it leans a tad more toward stiff and rubbery but not overly much. Perhaps it might sit at the 58% mark between perfect and chewing an eraser. It does tend to get a bit more rubbery after you have been chewing it for an hour but I wont subtract points for that. I think the average gum chew is far less time than Xylish’s rubber point and I’m not sure many of the gums out there would last as long.